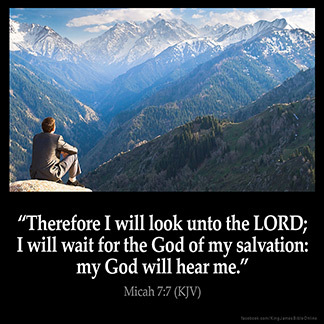 MICAH 7:7 KJV "Therefore I will look unto the LORD; I will wait for the God of my salvation: my God will hear me." 4The best of them is as a brier: the most upright is sharper than a thorn hedge: the day of thy watchmen and thy visitation cometh; now shall be their perplexity. 5Trust ye not in a friend, put ye not confidence in a guide: keep the doors of thy mouth from her that lieth in thy bosom. 6For the son dishonoureth the father, the daughter riseth up against her mother, the daughter in law against her mother in law; a man's enemies are the men of his own house. 7Therefore I will look unto the LORD; I will wait for the God of my salvation: my God will hear me. 8Rejoice not against me, O mine enemy: when I fall, I shall arise; when I sit in darkness, the LORD shall be a light unto me. 9I will bear the indignation of the LORD, because I have sinned against him, until he plead my cause, and execute judgment for me: he will bring me forth to the light, and I shall behold his righteousness. 10Then she that is mine enemy shall see it, and shame shall cover her which said unto me, Where is the LORD thy God? mine eyes shall behold her: now shall she be trodden down as the mire of the streets. Therefore I will looke vnto you the Lord: I will waite for the God of my saluation: my God will heare me. But as for me, I will watch expectantly for the LORD; I will wait for the God of my salvation. My God will hear me. But as for me, I will look unto Jehovah; I will wait for the God of my salvation: my God will hear me. But as for me, I am looking to the Lord; I am waiting for the God of my salvation: the ears of my God will be open to me. Therefore I will look to the LORD; I will wait for the God of my salvation: my God will hear me. But as for me, I will look to Yahweh. I will wait for the God of my salvation. My God will hear me. And I -- in Jehovah I do watch, I do wait for the God of my salvation, Hear me doth my God. 'But as for me, I will look unto the LORD; I will wait for the God of my salvation; my God will hear me. 7:7 Therefore - Since all sorts of men are so perfidious. Look - As one set in a watch - tower looks round about, and diligently observes all that stirs, so will the prophet; so did they who in Israel and Judah feared the Lord. This scripture shows me to have patience on my part. Sometimes you want to move ahead and make decisions without first consulting God. A lot of times this turns out disastrous. I am continuing to make it a point to take my matters to Jehovah God in prayer, and then WAIT for his direction to act.